Authors: Contributing authors Lenora Worth, Debra Ullrick, Janet Tronstad, Carolyne Aarsen, Dana Corbit, Lyn Cote, Debby Giusti, Winnie Griggs, Arlene James, Deb Kastner, Renee Ryan, Danica Favorite, Gail Gaymer Martin, Jill Kemerer, Jolene Navarro, Marta Perry, Terri Reed, Sherri Shackelford, Cami Tang, Missy Tippens, Pamela Tracy, and Cheryl Wyatt present an anthology of sweet and inspirational short stories and tasty recipes. Divided into three sections, Salads/Sides/Soups, Main Dishes and Desserts/Treats, A RECIPE FOR ROMANCE features contemporary and historical stories as well as sweet tales with a touch of suspense. Each author shares her personal favorite recipe and a related story in a collection that focuses on happy stomachs and Happily Ever Afters. 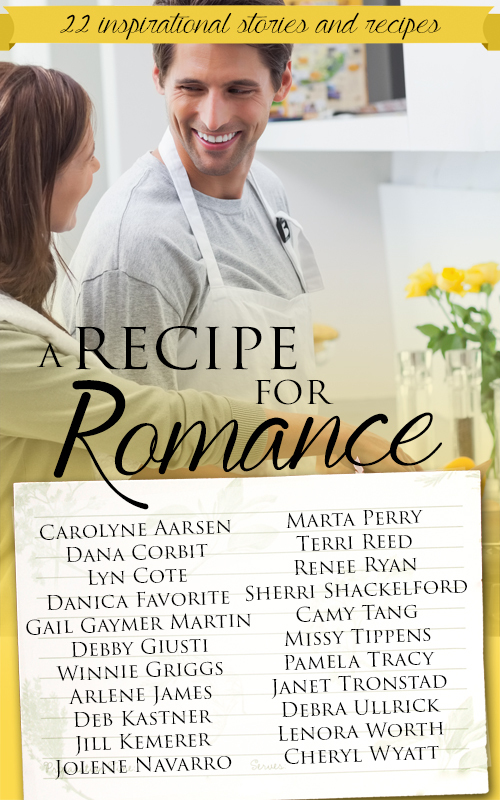 Buy A Recipe for Romance Now!